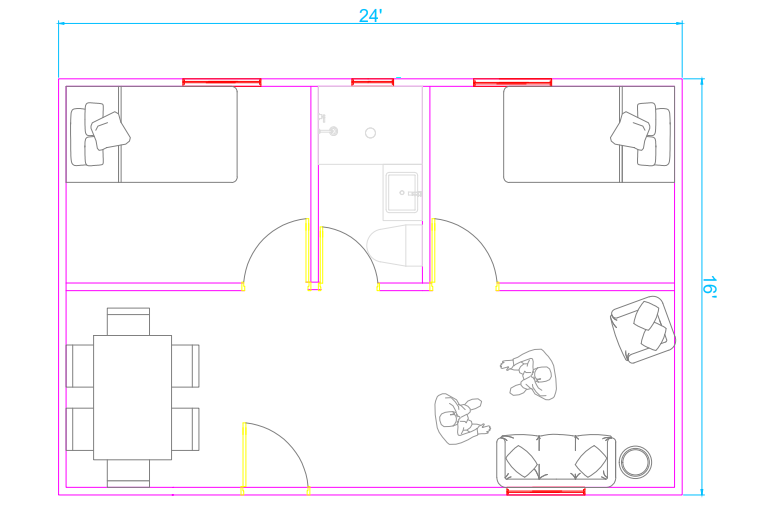 Our standard home is 16x20 square feet, totaling 320 square feet. It includes drywall, shingled roof, 3 windows, 1 door, 3 rooms, furniture, electricity, and furniture. The price also includes the concrete foundation and all of the necessary building materials. 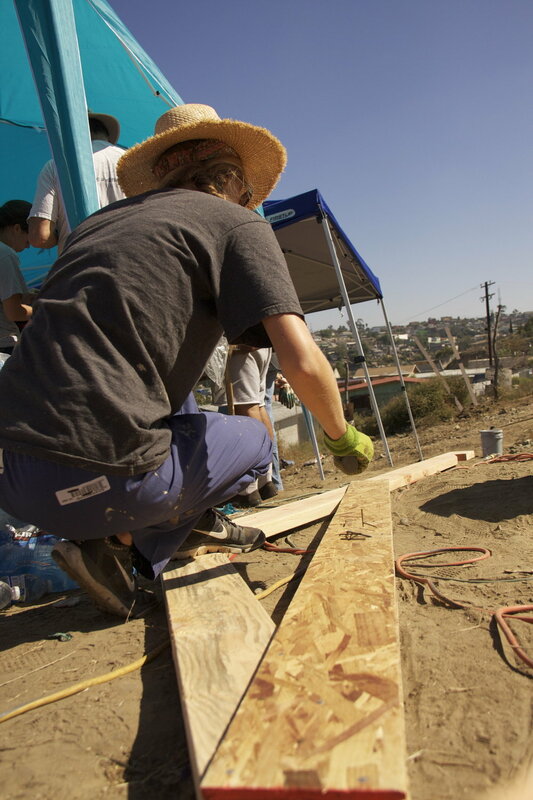 Families will usually build an outhouse or bathroom after the build. Our newest model home is 16x24 square feet, providing families with an extra 64 square feet to create a total of 384 square feet. This home comes with all of the standard home features with an added bathroom that includes plumbing. Trusses. Framing. Cutting. Painting. Decorating. Trim. Shingle. Roof. Before we arrive families begin the building process by clearing their land to make way for a concrete slab. Once the land has been cleared, our carpenters in Mexico pour a concrete slab that will be the physical foundation and floor for the home. This happens before we arrive at the site a week prior. During a build we will have a master carpenter lead a team for trusses/ roof and another one for framing/ walls. The other teams are led by builders like you! Our cut, paint, trim, and decorating teams are led by builders. We help you every step of the way and are there to answer any of your questions. Builders can choose a team at the beginning of the day but may change teams throughout the day to try something new. When we arrive, the concrete is dry and ready to build on! We begin by moving all of the wood off of the concrete and out to the painting area. Framing gets started while trusses are marked and cut. The painting team begins by painting the siding followed by the plywood for the roof. When the walls are framed, siding is put on and the truss team begins assembling the trusses. By about noon, the trusses are finished and painted and the walls are ready to be lifted. Once the walls are lifted the trusses go in for the carpenters to flip and position. While the trusses are being lifted, the dividing wall is built inside, drywall and electricity begin. Once the trusses are in place, the side trim goes on, followed by the plywood. Drywall progresses inside and builders begin working on placing the windows in and outside trim. Soon after the plywood is nailed in the facial goes on the front and back of the house. By the end of the day the drywall is basically finished, the plywood is on the roof, the windows are in and outside trim has begun. The following day involves more intricate work. Carpenters will roll the paper onto the roof and prepare for shingles. Inside, drywall is painted and sockets and light switches are wired. Once the paper is in place, the team helps shingle the roof while other builders inside begin interior trim. During this time, a team of builders takes a visit to our storage shed and chooses decorations and furniture for the house. By the time they get back, the roof is done and the interior trim is close. Covers are placed on all sockets and light switches and bulbs go in. Once the interior trim is finished, decorations and furniture make their way into the house. Now we turn it over to our decorating team!